In the pharmaceutical industry, a consistently high product quality is critical to the survival of any manufacturer. Apart from reliable and reproducible process monitoring, this requires components that can be cleaned and sterilized with absolutely no residue. The systems and sensors used in production must be designed to refl ect this requirement. Negele Messtechnik has brought out two build-in systems for the pharmaceutical industry that it developed specifi cally to meet these demands. 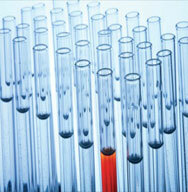 Many systems in the pharmaceutical industry exhibit very small nominal diameters. With PHARMadapt ESP, Negele off ers precisely sized measurement points with nominal diameters from DN 9 for pipe elbows and DN 10 for straight pipe. 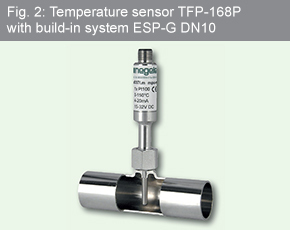 The exactly defi ned submersion depth of these sensors ensures measurement precision in both installation situations. 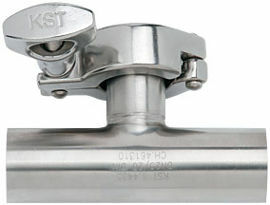 Highly accurate temperature measurement, rapid response times and the lack of need to open process pipelines are the main advantages of this system, giving it a signifi cant edge over the commonly used pipe-mounted sensors.With a design that is devoid of dead leg, the ESP measurement points are easy to clean. In addition, cleaning is supported by the high fl ow speeds in the CIP process that cause the measurement tip to be actively fl ushed. The hygienic construction has been awarded certifi cation according to the 3-A 74-06 Sanitary Standard. The prefabricated build-in pipes can be quickly integrated in the production pipelines in a clean and cost-eff ective manner by means of orbital welding. In addition to all nominal diameters up to DN 100 as per the DIN, ISO and ASME pipe standards, the units are also available in diff erent surface qualities (electropolished). All standard certifi cates in this sector can be provided (including inspection certifi cate 3.1, surface roughness, and delta ferrite content). The temperature sensor comes in a variety of models that are compatible with the build-in system.These include a standard sensor head for diff erent head transmitters and a miniature version for cramped installation conditions. A major advantage of the ESP system is the ability to remove the sensor for calibration without opening the process pipelines or detaching the electrical connection. As a result, system maintenance is quick and cost-eff ective. Another benefi t is reliability, since lines cannot be accidentally opened during procedures such as steam sterilization. 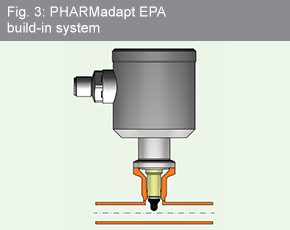 A further build-in system for pharmaceutical applications is the PHARMadapt EPA product series.In developing the EPA system, the special requirements and standards of the pharmaceutical industry were taken into account, resulting in a very compact measurement point with an elastomer seal, optimal hygienic design and rapid sensor installation.With EPA-8, the user can now not only measure temperatures, but can also record the level in pipes with a nominal diameter of DN 8 and larger. For pipes with diameters larger than DN 25, the EPA-18 installation system is available as a variant with the necessary geometry.The weld-in pipe and sensor are constructed in such a way that the sensor tip always reduces the cross-sectional area of the pipe by a fi xed amount. In addition, the confi guration is free of dead leg and gaps. 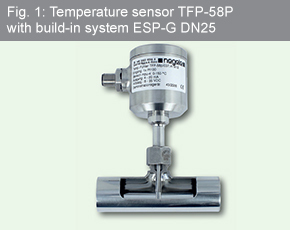 The measurement point design was developed in view of the EHEDG guidelines, and the hygienic design of the installation fl anges and sensors is certifi ed according to the 3-A 74-06 Sanitary Standard.Like the ESP build-in system described above, the PHARMadapt EPA off ers the advantage of prefabricated build-in pipes, enabling the unit to be installed rapidly and cost-eff ectively by means of orbital welding. Here, too, the DIN, ISO und ASME pipe standards are available with the various surface qualities and certifi cations. 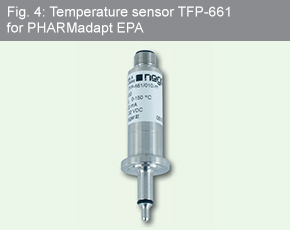 The EPA system makes use of temperature sensors that are equipped with weight-optimized and vibration-resistant pharmaceutical sensor heads and that are capable of holding a variety of measurement transducers. These process connections can also hold miniature temperature sensors that feature a M12 plug-in connection or a fi xed cable connection.Components in contact with the product are made of stainless steel 1.4435, for which an inspection certifi cate 3.1 as per EN 10204 is available. To achieve optimal measuring results, the build-in pipes are available in lengths that are in accordance with the respective nominal pipe diameters. The new capacitive level switches of the NCS series can now be used in these applications. Designed specifi cally for the pharmaceutical industry, these devices have been fully reworked and their scope of functions broadened. Thanks to their extended measurement range, the new devices can be used with media that up to now could not be measured.Thus, this new generation of sensors can be used to reliably detect media with a dielectric constant > 2, such as sun screen and skin lotion. A particularly useful technical innovation is the heated electronics, which prevent the development of condensation in the sensor housing. Other features are a very short response time and the possibility of simulating the sensor states. The new electronics are housed in a weight-optimized sensor head.The standard head design features a window in the cover for viewing the switching state of the sensor and an M12 plug-in connector with protection class IP 69 K.The parts of the sensor that are in contact with the process media are made from FDA-compliant materials. 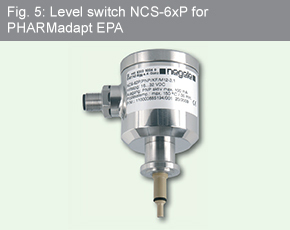 The NCS level switch for EPA-8 has a sensor tip of stainless steel 1.4435 with a PFA coating.The coating ensures that the sensor will function properly even in cramped conditions and with very small nominal pipe diameters. The plastic material PEEK is used in the variant for the EPA-18 build-in system. The corresponding material verifi cations are available on request.With the PHARMadapt EPA and PHARMadapt ESP build-in systems, Negele Messtechnik GmbH is once again proving itself to be an innovative and fl exible provider of measurement point solutions that are a perfect response to customer demands.